Clinton, Trump supporters unite to watch returns. 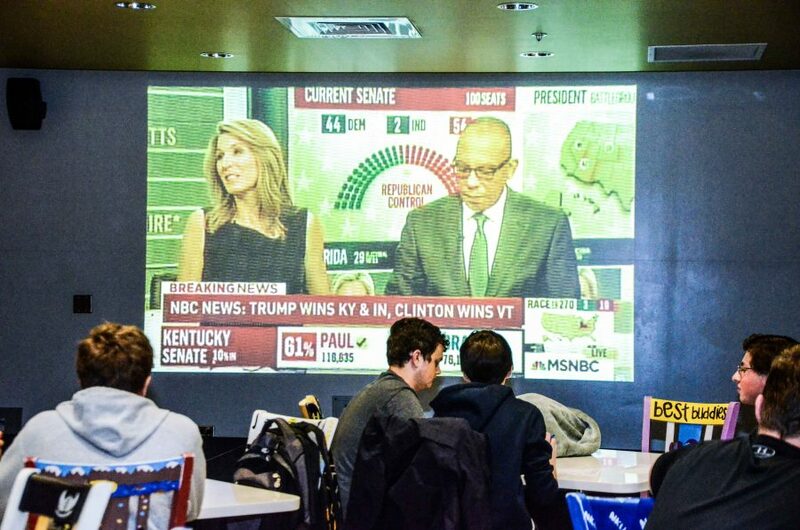 Event organizers hosted the event that would allow students to watch the returns regardless of which candidate they supported. Sophomore James Lyons, an organization leadership and political science major, came to the APB event. Lyons said he feels that Trump will help our country gain respect. Kylie Phillips, senior public relations major, doesn’t necessary agree that Hillary is the best choice, but she has always leaned towards democratic views. “I can’t stand Trump, he seems scary and full of hate,” Phillips said. NKU alum Leah Koch, coordinator of programming and advisor to APB, can sympathize with both sides. Koch said that she understands why students would agree with stances by both candidates. “Perspectives are in place and I can understand why someone’s background might have them lean towards a different way versus the other,” Koch said. Despite the fact the race might not be decided by 10 p.m., the APB announced the party would end at that time. Past presidential races have extended into the early hours on Wednesday.